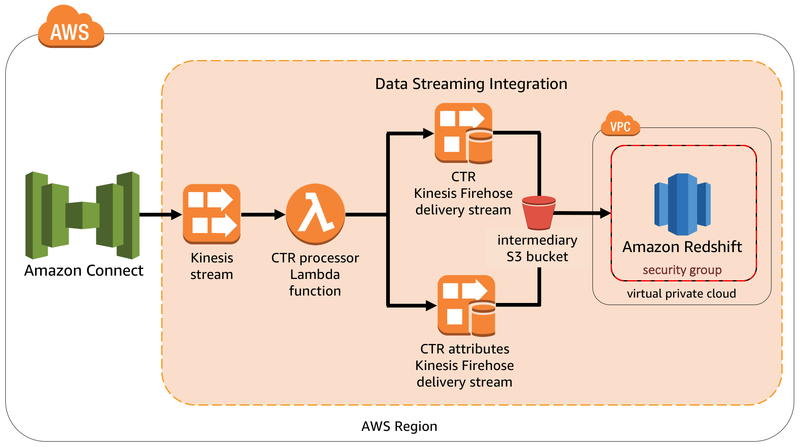 This integration enables Amazon Connect to communicate with Amazon Kinesis and Amazon Redshift to enable streaming of contact trace records (CTRs) into Amazon Redshift, within a secure virtual private cloud (VPC). You can extend the templates for additional Kinesis Firehose streams, such as for loading data into Amazon Elasticsearch Service (Amazon ES) or Amazon Simple Storage Service (Amazon S3). You can choose from two AWS CloudFormation templates. Use the master template to create a new VPC, based on the Amazon VPC Quick Start, and then to deploy the AWS components for the integration into that VPC. If you have an existing VPC that's properly configured, use the workload template to provision the necessary AWS components into your VPC. Complete the parameter fields. Deployment takes just a few minutes. Amazon Connect integrations are currently supported in the US East (N. Virginia) Region only. Step 4 Enable data streaming. Follow the steps in the Amazon Connect documentation to set up data streaming.